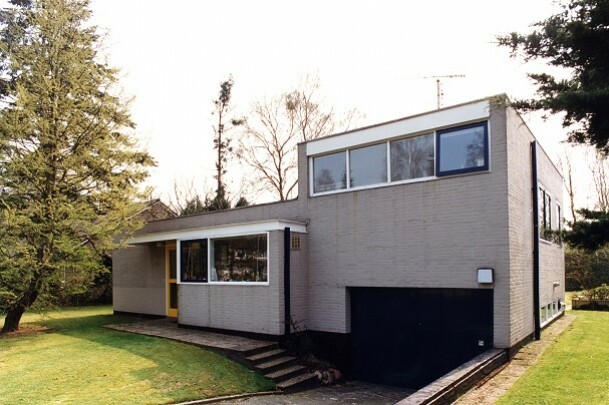 Rietveld designed this simple residence for J.D.J. Pronk, director of what was then the Enschede Academy of Art & Industry. The less-tall volume contains the living room, kitchen, bedroom and bathroom and the taller volume the garage a half-level down and a guest room above that. A generous expanse of glass in the bay-like kitchen unit next to the entrance gives a panoramic view of the street. The glazed garden side of the living room can be opened up with a large sliding glass panel. Facades are of whitepainted brick atop a black plinth. The blue garage door, the occasional blue window frame and the purplish brown front door add touches of colour to the otherwise uneventful exterior. The inner side of the front door is painted the same pale yellow as all the other doors inside the house.